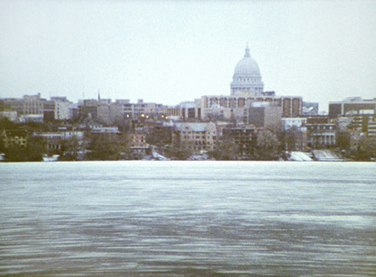 A view of the frozen and bleak Lake Mendota with the city of Madison, Wisconsin, in the background is projected on one wall of the exhibition space at floor level. After a moment the specator recognizes that the image is slowly drifting side-to-side at the same time that the image itself is panning slowly back and forth within the frame. Speakers in the room play back the voices of four children, residents of Madison, who speak about the human history of their city in terms of geologic time. Madison is nestled into the southwest corner of the terminal moraine (debris deposit) left by the most recent Wisconsin Glacier. Associating Madison with its unique geological history, connecting it to "deep time" and billions of years of earth’s past, can also occlude the more recent history of Indigenous inhabitation of the area. "Behind the Terminal Moraine" examines some of the ways language reveals and conceals these narratives.